Tidal wetlands consist of salt marshes, found mostly in temperate regions, and mangroves, found in tropical and subtropical regions. Marshes are dominated by grasses, notably the genus Spartina, rushes (Juncus, Schoenoplectus), sedges, forbs, and shrubs. Mangroves, salt and flood tolerant trees, and shrubs that inhabit the intertidal zone, are dominated by the genera Rhizophora, Avicennia, Laguncularia, Conocarpus, Sonneratia, and others. Similar to dunes, tidal marshes were used for centuries for grazing and for mangroves, for silviculture, and for gathering firewood. In Europe, the United States, and elsewhere, levees were constructed around tidal marshes to isolate them from the sea for agriculture. Like dunes, today tidal marshes and mangroves exist in a fragile environment squeezed by human encroachment. Vegetation of tidal wetlands often grows in distinct zones determined by tidal inundation and salinity. 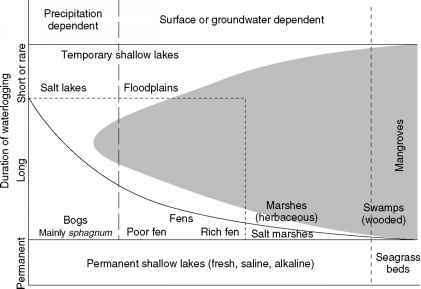 Marsh vege tation often is separated into 'low' and 'high' marsh based on the frequency of tidal inundation. Smooth cordgrass, Spartina alterniflora, of the US Atlantic coast, forms mono typic stands in the low marsh, where inundation by the astronomical tides occurs twice daily. Other species of Spartina (i.e., S.foliosa on the US Pacific coast, S. townsendii in Europe, S. anglica (the fertile form of S. townsendii) in China) and some forbs (e.g., Halimione portulacoides) domi nate the low marsh in other parts of the world. A different assemblage of species grows at higher elevations, in the high marsh. In the US, needlerush (Juncus roemerianus), saltmeadow cordgrass (S. patens), and salt grass (Distichlis spicata) grow in the high marsh. Puccinellia maritima is common in the high marshes of Western Europe. Tidal wetland vegetation varies with the salinity of tidal floodwaters. Salinity, mostly sodium chloride, stres ses plants by altering osmotic potential that interferes with water and nutrient (N) uptake. High marsh vegeta tion generally is less tolerant of salinity than Spartina and grows better at higher elevations in the marsh and in areas farther away from the ocean, where salinity is diluted by freshwater. In arid and semiarid regions where precipita tion is low and evaporation is high, salinity of floodwaters may exceed that of seawater, which is 35 parts per thou sand (ppt). In these regions, salt tolerant halophytes such as glasswort (Salicornia spp. ), saltwort (Batis spp. ), and others (Borrichia, Suaeda, Distichlis) dominate. Vegetation grows slowly and cover is sparse in these salt stressed tidal wetlands. Similar to marshes, mangrove vegetation grows in zones related to hydroperiod and salinity. In the Western Hemisphere, red mangrove (Rhizophora mangle) grows closest to the water's edge while black mangrove (Avicennia germinans), white mangrove (Laguncularia race mosa), and buttonwood (Conocarpus erectus) grow further inland. Salt marsh vegetation, including Spartina, Distichlis, Batis maritima, Sporobolus virginicus, and others, often is found growing with mangroves. Figure 4 Tidal marsh restoration on (a) dredge spoil and (b) graded upland soil, (c) the redge spoil marsh, and (d) the graded upland marsh 7 years after restoration. elevation range exists where vegetation can be success fully established and the width of this zone will depend on slope of the land and tide range. A large tidal range and gentle slope (1-3%) will produce the maximum amount of potentially restorable marsh area (Figure 4a). Low marsh vegetation such as Spartina alterniflora grows at elevations between mean sea level and mean high water. Above mean high water, inundation is less frequent and 'high' marsh vegetation such as S. patens, Distichlis spicata, and Juncus roemerianus grow between mean high water and the mean spring high tide line. Where tidal inunda tion is less predictable or where tide range is small, small differences in elevation produce distinctly different plant communities. In North Carolina (USA), four different species grew in distinct zones, all within an elevation range of less than 30 cm. Thus, it is critical to understand the hydroperiod requirements of different species so they can be planted in the appropriate elevation zones. Determining the appropriate salinity regime also is critical for successful establishment of tidal wetland vege tation. Smooth cordgrass and red mangrove grow well in areas regularly inundated by a mixture of freshwater and seawater, in the range of 20-30 ppt. Other species are less tolerant of salinity and should be established in areas where salinity is lower, from fresh (0 ppt) to brackish (15-20 ppt) salinities. 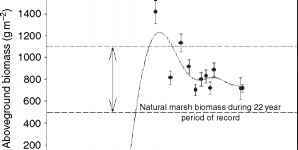 Soil properties also determine whether tidal marsh vegetation becomes established or not. Nitrogen, in par ticular, limits growth of Spartina and other vegetation so N additions usually are needed to jumpstart the plant community. On sites that are planted, success is best achieved when N is added in slow release form directly into the planting hole. Sufficient phosphorus (P) is brought in by tidal inundation so that P additions usually are not necessary. Wetlands created on upland or terrestrial soils pose significant problems. Grading the site to intertidal eleva tions exposes subsurface soils (Figure 4b) with high bulk density that impedes rooting. Subsoils also contain essen tially no organic matter and N. In some situations, grading exposes acid sulfate soils (Table 1) with low pH (2-3) and high ferrous iron (Fe2+) concentrations that kill vegetation. In addition to N, establishment of vegetation on graded upland soils requires additions of lime to raise the pH and P to counteract the high Fe content that immobilizes P. Because of the problems involved with creating wetlands on upland soils, empha sis today is on restoring degraded wetlands back to health rather than creating entirely new ones. Other advantages of restoring tidal wetlands, rather than creat ing entirely new ones, is that restored sites contained wetland vegetation and soils in the past so the restoration effort begins with soils that contain some relic organic matter, N and, possibly, viable seeds. On sites such as dredge spoil, where no vegetation existed and no seed bank is present, vegetation needs to be planted. Similar to dune vegetation, marsh and man grove vegetation should be planted early in the growing season, before soil temperatures get too high. Seeding or sowing rhizome fragments usually is ineffective because tidal inundation disperses the seeds and fragments from the site. This is especially problematic on sites with a long fetch that enables large wind generated waves whose energy translates onto the site and may uproot even planted vegetation (Table 1). Herbivory by geese, nutria (Myocastor coypus), and muskrats (Ondatra zybethicus) that graze on aboveground biomass also may hinder establish ment of vegetation in tidal wetlands. Large scale efforts to restore tidal wetlands began in the last century as marsh and mangrove vegetation was planted throughout the world to control coastal erosion and reclaim land. Documented accounts of large (9000 ha) mangrove plantings date from the late 1800s. Cordgrass, Spartina townsendii, was transplanted extensively in Europe in the 1920s and 1930s to slow coastal erosion, reduce channel siltation, and to reclaim land for agricul ture. From the 1930s to the 1960s, S. townsendii and smooth cordgrass, Spartina alterniflora, were planted in Australia, New Zealand, the United States, and China for the same reasons. One of the first systematic efforts to create and restore tidal wetlands was initiated by the United States Army Corps of Engineers (COE) in the 1960s and it was focused on creating salt marshes using dredged material. The COE began planting smooth cordgrass on material dredged from navigable waterways to stabilize dredged material by establishing vegetation (Figure 4c). The technique proved successful and, in the 1970s, S. alterni flora was successfully used to stabilize eroding estuarine shorelines. In the 1980s, salt and brackish water were created and restored to mitigate or replace wetlands lost to mineral extraction, highway and pipeline construction, dredging activities, oil spills, and coastal development (Figure 4d). Most of these wetlands were created using dredged material or graded upland sites or by restoring hydrology to diked marshes. Restoration usually involves removing dikes, levees, or tide gates to restore tidal inun dation to promote growth of marsh vegetation and initiate wetland soil formation. In the northeastern US, restora tion frequently involves removing tidal gates that were installed, in some cases 100 years ago, to exclude tidal inundation and reduce flooding of coastal communities. Once the tide gates are removed, tidal inundation and salinity are reintroduced and S. alterniflora gradually replaced freshwater wetland vegetation. Successful restoration of hydroperiod and vegetation does not ensure immediate recreation of wetland func tions on the site though. Created and restored tidal wetlands are young relative to older, mature, wetlands and some time must pass before ecological functions such as productivity, biogeochemical cycles, and habitat develop to levels found in older natural wetlands. Many wetland functions depend on establishment of a produc tive plant community with good spatial coverage. Emergent vegetation is important for dissipating energy from waves and for stabilizing sediments, and good cover age usually develops within 3-5 years following planting (Table 2, Figures 5a and 5b). Woody vegetation such as mangroves takes longer to form good coverage. Also, mangroves are susceptible to attack by fungal pathogens and the isopod, Sphaeroma, which may slow the restoration effort. Biogeochemical functions such as sediment deposition, carbon sequestration, N and P accumulation in soil, and microbial N fixation also develop within 3-5 years. Heterotrophic microbial processes (decomposition, methanogenesis, and denitrification) and soil inverte brates are strongly linked to soil organic matter so sufficient organic matter must accumulate to support these processes, usually about 5-15 years (Table 2). Soil formation takes longer to develop, on the order of tens to hundreds of years. 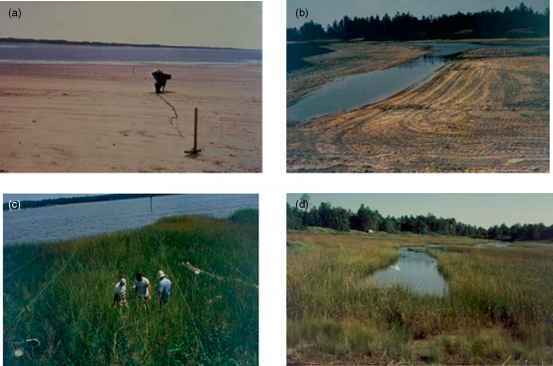 Figure 5 Development of above- and belowground biomass stocks over time on a constructed Spartina alterniflora marsh in North Carolina (USA). Reprinted from Craft C, Reader J, Sacco JN, and Broome SW (1999) Twenty-five years of ecosystem development of constructed Spartina alterniflora (Loisel) marshes. Ecological Applications 9: 1405-1419, with permission from the Ecological Society of America. Animal use of created and restored wetlands depends on their ability to disperse to and colonize the site. Invertebrates with planktonic (free swimming) larvae readily disperse to the site whereas invertebrates that lack planktonic larvae take much longer to colonize. Oligochaetes, a major component of the salt marsh benthic invertebrate community, lack planktonic larvae and several decades elapsed before these organisms colo nize the site. Fish and birds readily use created and restored wetlands once hydrology is restored and vegeta tion covers the site (Table 2). Fish use is enhanced by maximizing the amount of edge between vegetation and open water. Waterfowl use of created and restored wet lands is enhanced by increasing the proportion of open water, up to about 50% of the area. Songbird use increases with amount of woody shrubs which takes longer to develop than herbaceous vegetation. Ecosystem development of tidal wetlands is acceler ated by addition of fertilizer N and seasoned organic matter that jumpstart plant growth and heterotrophic activity. Amending soils with organic matter, however, is costly and time consuming and generally is not employed for most projects. In recent years, large scale restoration of tidal marshes has been undertaken for mitigation of natural resource damages. In Delaware Bay (USA), Public Service Electric and Gas developed a large scale estuarine enhancement project to mitigate for loss of finfish caused by entrain ment in power plant cooling water. As part of the enhancement effort, tidal inundation was restored to 1800 ha of diked salt hay (Spartina patens) marsh to create new habitat to enhance fisheries production in the estuary. In the Mississippi River delta (USA), tidal wetlands are restored to combat wetland loss attributed to natural subsidence and anthropogenic factors that exacerbate it. Enacted by the US Congress in 1990, the Coastal Wetland Planning, Protection, and Restoration Act (CWPPRA) was designed to protect, restore, and create tidal wetlands by freshwater and sediment diversion from the Mississippi River and by beneficial use of dredged materi al. CWPPRA spends about 40 million USD annually to support wetland restoration in the delta. In 1997, a long term plan, Coast 2050, was developed to combat wetland loss in the region. The goal of Coast 2050, which has yet to be implemented, is to restore more than 10 000 km2 of coastal wetlands over the next 50 years, with a price tag of 14 billion USD.